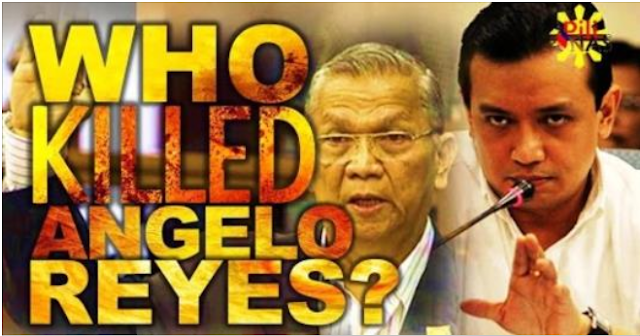 A video by website PiliPinas detailed how it was Senator Antonio Trillanes who should be blamed for the suicide of former Defense Chief Angelo Reyes. Reyes and Trillanes clashed in a Senate hearing on January 2011 where Reyes was accused of receiving fifty million as "pabaon" when he bowed out of service in 2001. Trillanes humiliated and told his senior that the latter had "no reputation to protect". He said he was puttinh Reyes "in his proper place". Emotional stress was pointed as the reason for Reyes' suicide in 2011. President Rodrigo Duterte blamed Trillanes for his "misconduct" which led to a well-respected man ending his own life. "Imagine what happened to General Reyes sinabihan niya (Trillanes) publicly na 'no, stop it, you do not have any dignity'", he said, mocking how Trillanes was supposed to act like a graduate of the Philippine Military Academy, and whose education was paid for by every Filipino. "Akala mo ikaw lang ang may prinsipyo," Duterte said, "Hanggang senador ka lang eh, baka next election hindi ka na manalo". Duterte said that military should be capable of respect and threatened that should Trillaness disrespect anyone from the military, he will order them to stop obeying him. "Do not shout at the military or the police, I will not allow it. If you continue na babuyin ang mga tao na hindi man lang makadipensa, magpakamatay lang, I will order the military and police, do not obey his orders," the president said. He said military men should be treated with respect because they offered their lives for the country.